Denver garage owners know the headache that comes with winter weather, and the Colorado’s garage door specialist at Colorado Overhead Door Company are here to help you solve this issue. When it comes to selecting the material for your garage floor, it is important that you are able to have an idea of your expectations for your space. Should you simply need a garage for storing your car, concrete might be your best option. Are you looking to complete auto projects that create a greasy mess? Maybe you should install an epoxy floor. What ever material you decide to use for your garage, floor mats can provide the perfect form of protection and help to extend the life of your garage. When installing your garage in Denver, it is important to realize how both ice and snow are able to find their way into your garage, no matter how well closed in you might think it is. Both melting snow and the water that falls off of the bottom of your car can pool in your garage, causing a slippery mess. When the temperature drops once again at night, the standing water can freeze causing an even greater hazard for you and your family. The addition of mats allows you to create a textured surface that prevents slips and falls, giving you a much safer garage. These mats are able to absorb gallons of water, and while that might sound excessive, large cars can hold large amounts of snow. The use of garage weathering strips helps to keep water from entering your garage, but during a snowstorm the ice and snow have plenty of time to melt and find there way through and stressed areas in your seals. The best mats to battle winter elements are made of polyvinyl, and have hard snap in edges to help contain the water. Owners can use shop vacuums to remove all absorbed, and can also remove the borders and squeeze the water right down the driveway. Interestingly enough, the salts used to combat icy roads can harm your concrete floor. This causes a process known as spalling which can cause your concrete to weaken and break over time. By parking your car on a garage mat, you can prevent your floor from coming in contact with the salt that has accumulated on the bottom of your car. 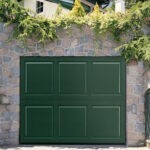 Should you be one of the many Denver residents looking to install a garage on your property, call the team at Colorado Overhead Door Company today. Their installation and garage repair team is one of the most trusted in Denver, and they can help you get the most out of your new garage.